Hardwood Plywood is plywood which has a face and back veneer of hardwood as opposed to a softwood such as pine, cedar, spruce etc. Hardwood plywood panel comprises of a core made from either softwood or hardwood then faced and backed with a veneer of finish or stain grade hardwood and therefore can be used in the manufacture of furniture, cabinets, millwork and other decorative applications. It’s no wonder that hardwood plywood long ago supplanted solid lumber as the material of choice for built-ins, cabinets and many kinds of furniture. More stable than solid wood and available in many grades and species, plywood is relatively economical. Alder, Ash, Beech, Birch, Bamboo, Cherry, Hickory, Mahogany, Maple, Poplar, Oak, Teak, Walnut, Wenge, Zebrawood and much more. Hardwood Plywood is used in millwork for the crafting of furniture, cabinets, chests, built-in closets, kitchens, architectural applications, doors, paneling, toys, musical instruments, sporting equipment, skateboards etc. Most Hardwood plywood is made with Formaldehyde free glues which are not moisture resistant and are therefore Interior Grade panels. Certain specialty applications such as the Marine Industry, use exterior grade Hardwood Plywood which is available by special order. Many thicknesses, sizes, and grades are available. 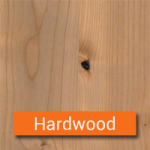 Hardwood Plywood is manufactured by domestic mills throughout the United States of America and also imported from mills in Europe, Scandinavia, the Far East and South America. Anderson’s hardwood plywood panels satisfy your every need for crafting sophisticated furniture, cabinets, exhibits, and displays. Beautiful veneers, stable cores, and functional finishes, in a multitude of combinations of grades and species, will cater to virtually any commercial or residential demand for fine cabinetry. Don’t see the Hardwood Plywood you need? We can create custom layups to your specie size specifications. Contact us for more information.